Preheat oven to 350°F. Line cupcake pans with paper liners. Prepare cupcake batter and bake cupcakes according to package directions. Let cupcakes cool. In a medium bowl mix the powdered sugar and frosting. Frost cooled cupcakes with white frosting and top each with a sugar cone. Color the rest of the frosting with green food coloring. To make the color more earthy, add a little brown or black food coloring. Using a star tip on a decorating bag (or resealable bag), pipe stars on the sugar cone to create a tree. Pattern does not have to be exact. The more random it is, the more it will look natural. Add sprinkles or other decorations to your tree. Enjoy! A pretty Christmas tree snuggles on a snowy cupcake. A sweet holiday vision, indeed. A Christmas tree that you can eat? Who knew I was an herbivore?! These Christmas Tree Cupcakes are a super cute holiday treat that are easy enough for the kids to help make, and they're sure to bring on some ooo's and ahhh's from those who receive them. They start with some baked cupcakes and some sugar cones, which are going to be the base of your tree. I love Betty Crocker's frosting because it's super creamy, but when you're piping frosting you want a little stiffer consistency so I added some powdered sugar to thicken it up. Frost your cupcakes generously with white frosting. This is going to be your fluffy white snow on the ground. Press a sugar cone on top. I was surprised how much the cupcake actually traveled up the sugar cone almost giving the illusion that the cupcake was actually baked in the cone. And yes, that's a toy plane in the background. Keeping it real, people...keeping it real. 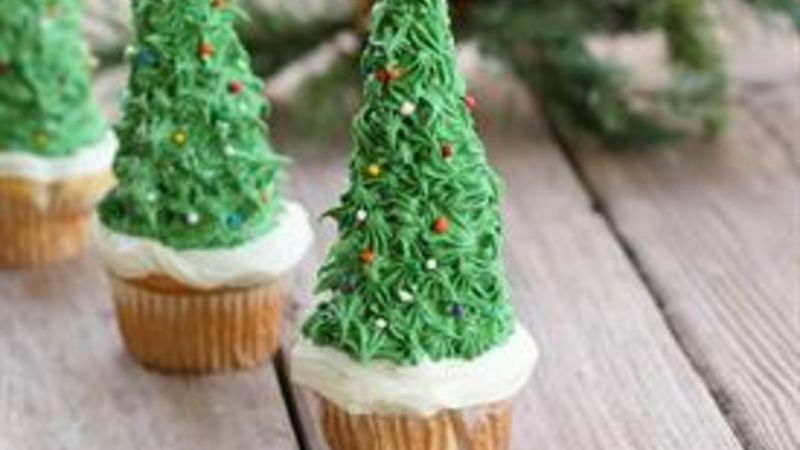 Next, add some green food coloring to your frosting for your tree. I like to add just a little bit of brown or black food coloring to it to give it more of an earthy green tone. Fill a pastry bag or resealable plastic bag fitted with a small star tip with your green frosting and start piping away. The beauty of this is that you don't want your pattern or stars to be perfect. When's the last time you saw a perfectly groomed tree? Random is good here. While the frosting is still wet, throw some sprinkles on for decoration. My son pointed out that I didn't have a star and carefully topped my tree with a large yellow sprinkle. I let my kids each decorate their own tree for an after school, after homework activity. My older son was able to pipe the frosting, but the younger ones just used a plastic knife and their fingers, I'm pretty sure. They were soooo proud of their creations! Notice the green mouth. I think someone was taste testing along the way.